Find out more about AAUW Seattle Branch membership or come to one of our events and see for yourself. By joining AAUW – American Association of University Women – we belong to a community that breaks through educational and economic barriers so that all women have a fair chance. AAUW is the oldest and largest national organization for women. It was founded in Boston in 1881 so women college graduates could join together in advancing equity for women in education and employment. AAUW Seattle Branch started in 1904. Headquartered in Washington, D.C., and with a total of 100,000 members, AAUW has over 1000 branches nationwide. The Seattle branch was organized in 1904. 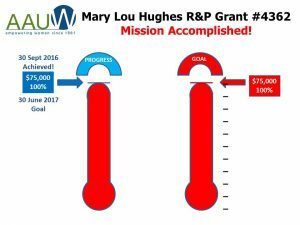 Thanks to all your donations we are 100% to our fund the Mary Lou Hughes R & P Grant Fund, #4362! It is now fully endowed at AAUW! 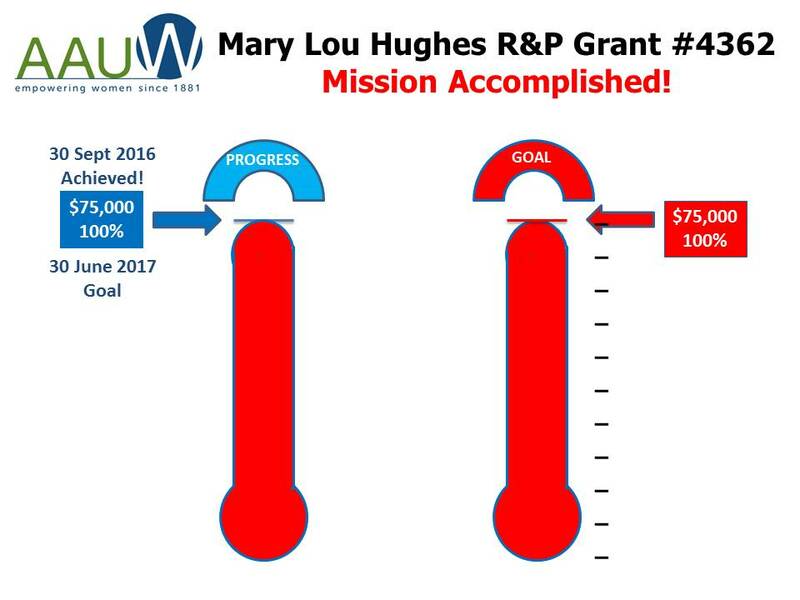 Thanks to generous contributions from Seattle and Highline Branch members, as well as from AAUW members across Washington State, the Mary Lou Hughes Research & Projects Grant Fund #4362 is now fully endowed. The Fund was established in late 2011 when our beloved longtime member Mary Lou Hughes passed away. In just five years, dedicated fundraising efforts resulted in the Fund reaching the $75,000 amount needed for the Grant to be established. The Mary Lou Hughes R&P Grant will now be awarded to deserving applicants each and every year well into the future.